Ht / Wt: 6'1" / 207 lb. 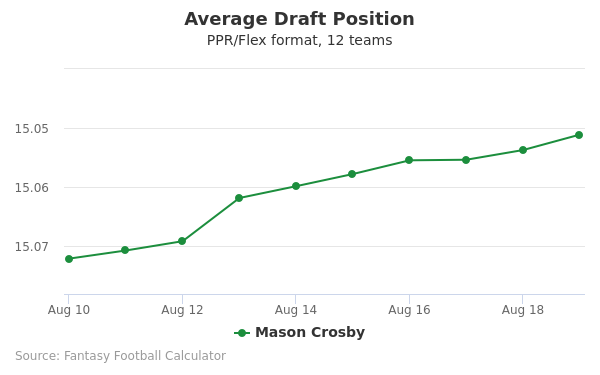 Mason Crosby's fantasy value is measured by his average draft position (ADP) in fantasy football mock drafts. 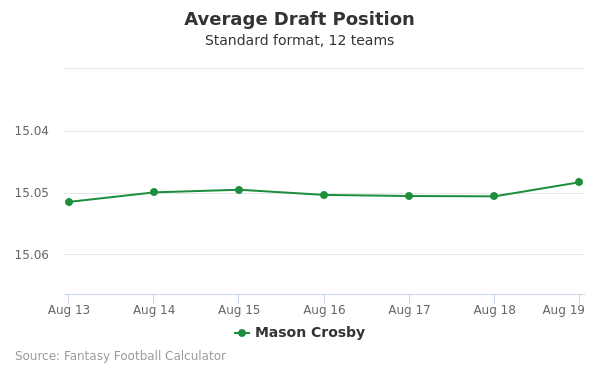 In recent drafts, Crosby's current ADP is 15.03, which indicates that his fantasy outlook is to be the 3rd pick of the 15th round, and 170th selection overall. 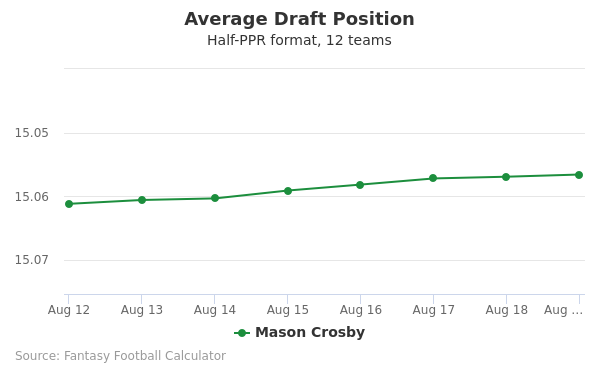 The code below will display a graph that updates every day to show the ADP data for Mason Crosby for the past 30 days in 12-team PPR leagues. Draft Duke Johnson or Mason Crosby? Draft Mason Crosby or Randall Cobb? Draft Brandon McManus or Mason Crosby? Draft Atlanta Defense or Mason Crosby? Draft Frank Gore or Mason Crosby? 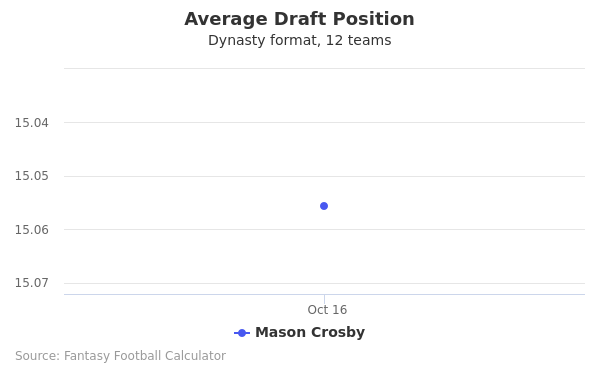 Start Duke Johnson or Mason Crosby? Start Mason Crosby or Randall Cobb? Start Brandon McManus or Mason Crosby? Start Atlanta Defense or Mason Crosby? Start Frank Gore or Mason Crosby? Mason Crosby was born in Lubbock, TX on September 3, 1984. His father Jim was a running back at Texas El Paso and received the Colorado Sports Performers of the Year award. His father filmed a NFL fantasy ad spot too. Mason attended Georgetown High School where he played soccer and football. When playing football in high school Rivals.com ranked him as third best place kicker in the United States. At Georgetown High School he earned recognition for his superior playing skills. Mason began playing football at Benold Middle School. When he graduated from Georgetown University in 2003 he received a full scholarship to play football at the University of Colorado. Here he really began his career as a rookie. He played at the University of Colorado from 2003 to 2006. The team was the Colorado Buffaloes where he scored a 60 yard field goal against Iowa State showing an amazing amount of strength in his legs. His field goal against Miami in 2005 was one of the longest kicks recorded in NCAA Division IA history. He developed a reputation for kicking well under pressure that was reflected his high scores. He won The Rocky Mountain Showdown in 2005. In his freshman year he became one of the second players to handle place kicking for the CU season opener in the school'sthe history. Crosby received first team honors from several different organization. The organizations were The Football Writers Association of American, Associated Press, and Walter Camp Football Foundation. In his senior year he was selected as first team All American. In his senior year he was named player of the week eight times for the Colorado Big 12 Conference. In this video he tells fans how to set up for a field goal. Crosby was chosen by the Green Bay Packers in the 2007 NFL Draft. He was picked in the sixth round as the 19th pick. The 2007 NFL Draft was held at Radio City Music Hall on April 28 and 29. This televised event was shown on ESPN and the NFL network. That year they picked 255 draft selections, A supplemental draft was given after the regular one. The first draft lasted a long time six hours and eight minutes. In 2015, he kicked 5 Points After Touchdown a high score in this category against the Kansas City Chiefs. His 56 yard field goal on November 1st against the Denver Broncos won him fan and team recognition. He kicked five field goals November 22,. He scored these points against the Minnesota Vikings. In January he fumbled the ball losing when playing the Minnesota Vikings. It was recorded as forced fumble. He was married to Molly Ackerman in June 28, 2008. They has three children. He is a loyal father and husband to his wife and kids. He is six feet tall one inch. Fans can follow him on Twitter and Facebook to learn more about the highlights of his career.